The St. Louis Section of the American Society of Civil Engineers (ASCE) presented its annual Young Engineer Award for Professional Achievement to Siavash Zamiran, PhD, adjunct professor of civil engineering in the Southern Illinois University Edwardsville School of Engineering. Zamiran received the honor during the 2018 Annual Awards Dinner on Friday, Sept. 21 at the Moto Museum in St. Louis. The Young Engineer Award recognizes professional contributions of younger members to the society and to the St. Louis section. It is presented annually to an ASCE St. Louis section member, who is judged to have attained significant professional achievement at less than 35 years of age. Since 2017, Zamiran has worked with Marino Engineering Associates in St. Louis, where he performs stability analyses of reinforced slopes and retaining walls, subsidence investigations, and computational structural analysis of high-pressure natural gas and petroleum pipelines affected by ground subsidence. Among Zamiran’s many activities within ASCE, he served as founder and former president of the SIUE Geo-Institute Graduate Student Organization where he was the instructor of four free public workshops in geotechnical engineering. Zamiran earned a PhD in engineering science – civil/geotechnical engineering from the SIUE/SIU Carbondale cooperative PhD program in 2017. He previously earned a bachelor’s in civil engineering and a master’s in civil-geotechnical from Azad University in Sanandaj, Kurdistan. During the same awards ceremony, SIUE senior civil engineering student Ryan Gueldener was among five students to receive ASCE St. Louis Section annual scholarships in recognition of membership in an ASCE Student Chapter, excellence in academic performance, and active participation in issues reflecting the role of engineers in the advancement of our society. 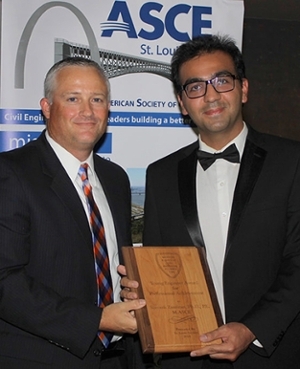 Photo: Siavash Zamiran receives the Young Engineer Award from ASCE St. Louis Section President Lyle Simonton.